Bamenda Archdiocese now has an auxiliary Bishop. He is Rev. Father Agapitus Nfon. In announcing the news, Archbishop Cornelius Fontem Esua said, “It was with emotions of profound gratitude to Almighty God that I received the information that the Holy Father, Pope Benedict XVI, had accepted my request to appoint an Auxiliary Bishop for the Archdiocese of Bamenda. This good news was officially made public today, Friday, 8th April, in the Vatican City, Rome, and was announced by the radio Vatican at mid-day. Father Agapitus told The Post, in a chat at the Bambui Seminary Rector’s office, Thursday, April 7, that .he was completely taken aback by the announcement because there are older and more experienced priests at the Seminary. "I didn’t consider myself worthy," he said, but quickly added that it was the will of God. He outlined his duty as an auxiliary Bishop, which is to assist the Archbishop of Bamenda in his pastoral, administrative and juridical functions. On when he is expected to commence his duty, the newly appointed Bishop said that since he is the Rector of the seminary, he must wait till the end of the year and conduct exams for the students. During that period, he added, somebody else will be appointed to replace him. Bishop Agapitus who said he had a special devotion to Mary, the mother of Jesus, said his motto will be: "Do what he tells you." He said he was inspired by the words Holy Mary spoke before Christ’s first miracle at Canaan in Galilee. On that occasion, Mary had told the servants at the wedding, who were worried about the shortage of wine, to do whatever Christ told them. Commenting on his work at the seminary, Monsignor Nfon said it was very challenging as he was a maker of young priests. Many of the priests under him, he said, were older; some had even been his teachers. "I was very uncomfortable at first, but they made me feel at ease through their collaboration,” he said, adding that he was confident that, with God’s guidance, he would be equal to the task of an auxiliary Bishop. Commenting on the appointment, Father Ernest Tubuo, a close collaborator, said: "It is always an honour when somebody close to you is appointed to an important position." He said becoming a Bishop was a radical change from priesthood. To succeed, he said, the new Bishop would have to put on the personality of Christ. "His duty is very demanding. But I am confident he will succeed," Fr. Tubuo said. Who Is Bishop Elect Agapitus Nfon? February 11, 1964: Born at Shisong of Pa Joseph Nfon, a Catholic Teacher (RIP) and Mama Odilia Kinenla. He is second of eight children – six girls and two boys. February 20, 1964: Baptised in St. Joseph’s Parish, Djottin, by Rev. Father Jansen, a Mill Hill Missionary (MHM). August 17, 1969: Received First Holy Communion and was confirmed on June15, 1971. 1969 – 1976: Attended St. Joseph’s Catholic School, Djotin. 1976 – 1983: Attended Minor Seminary in Bishop Rogan College, Soppo, Buea. 1983-1990: Enrolled in St. Thomas Aquinas Major Seminary, Bambui, an affiliate to the Pontifical Urbanian University, Rome. 1986-1990: Obtained a Bachelor’s Degree in Philosophy (B.Phil.) and a Bachelor’s Degree (B.D.) in Theology. June 29, 1989: Ordained deacon. 1990: Appointed to St. Martin de Porres Parish, Binju-Nkambe, and later to St. Theresa’s Quasi Parish, Sop, where he taught in St. Sylvester’s Catholic Comprehensive College. 1991: Ordained Priest by His Lordship, the Rt. Rev. Cornelius Fontem Esua, the then Bishop of Kumbo. 1991-1992: Served as Assistant Priest in St. Theresa’s Cathedral Parish, Manager of Catholic Schools in Kumbo and Meluv Parishes. 1991- 1993: Teacher and Chaplain in St. Augustine’s College, Kumbo and Manager of Catholic Schools of St. Pius X’s Parish, Tatum. 1994 – 1996: Served as Bishop’s Secretary and Diocesan Financial Secretary. 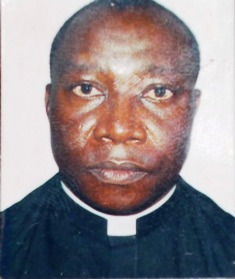 1996 – 1998: Principal of St. Augustine’s College, Kumbo and Diocesan Chaplain of the Catholic Women’s Association, C.W.A. 1998-2001: Obtained a Licentiate Degree in Theology (STL) at Institum Patristicum Augustunianum, Rome, where he specialised in Patristic Theology. 2005: Appointed Rector of St. Thomas Aquinas’ Major Seminary Bambui until he was recently appointed Auxiliary Bishop by the Holy Father.